[All photographs copyright, Gary Nunn 2012] – We had not gone far out of San Diego on the ocean today when a bright white object caught my attention on the water ahead. Just the quickest binocular view and I spotted the red immediately – not the usual piece of floating white bucket fooling me this time! Here was an adult Red-billed Tropicbird Phaethon aethereus sitting on the water just six nautical miles southwest of Point Loma! Digital cameras were quickly hoisted as the tropicbird took off flying and made a close circuit around the boat. In my opinion this tropicbird appears to be in “staffelmauser” molt of the remiges. Wing feathers look to be of different lengths – quite strange looking in fact. The secondaries are longest in the middle of the feather tract, at least on the right wing, while the primaries seem to be molting outwards. Clearly this bird could fly well, in spite of funny looking skinny wings, and it did not stick around for long just gracing us with the single circuit of the boat before determinedly heading off elsewhere. 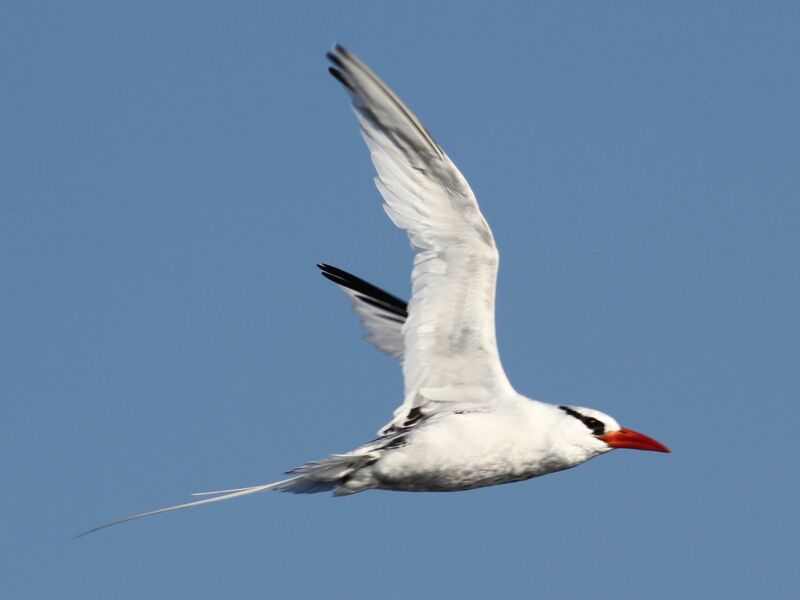 Red-billed Tropicbird is quite rare in San Diego County waters with perhaps only a few found each year. The last report came on 27 June 2012, also of an adult, although this individual was reported somewhat further offshore at 23 NM from Point Loma. Water temperatures are high at the moment off of San Diego. We encountered 68 degree Fahrenheit water very quickly and later found water temperatures of 71 degrees Fahrenheit and even a little higher. 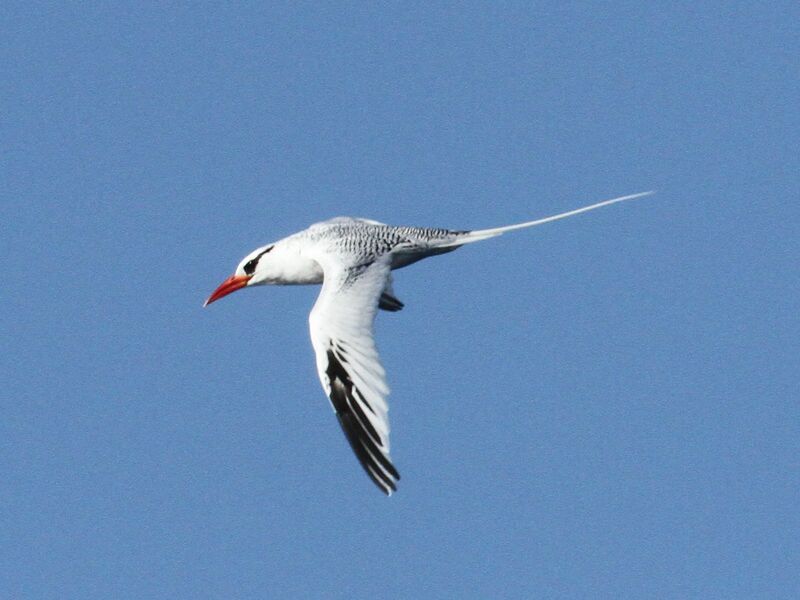 This might account for the close inshore Red-billed Tropicbird. We did not see many other seabirds on this trip, which seems to be a character of warmer waters. Many thanks to boat Captain Dave Povey and fellow crew members Steve Brad and Peter Ginsberg for a great day on the ocean.